Level icons indicate comfortable, un-comfortable and normal conditions. Habor hygrometer thermometer measures indoor humidity and indoor temperature in time help to adjust the humidifier, dehumidifier settings and humidistat, great for monitoring family's living conditions and health by preventing colds, dry skin, asthma, allergy, mold. Habor humidity gauge room thermometer with magnet attaching, table standing, and wall hanging design, put anywhere you want, convenient mounting feature for every type of room like kitchen, garden, greenhouse, basement, baby room, guitar room and office. 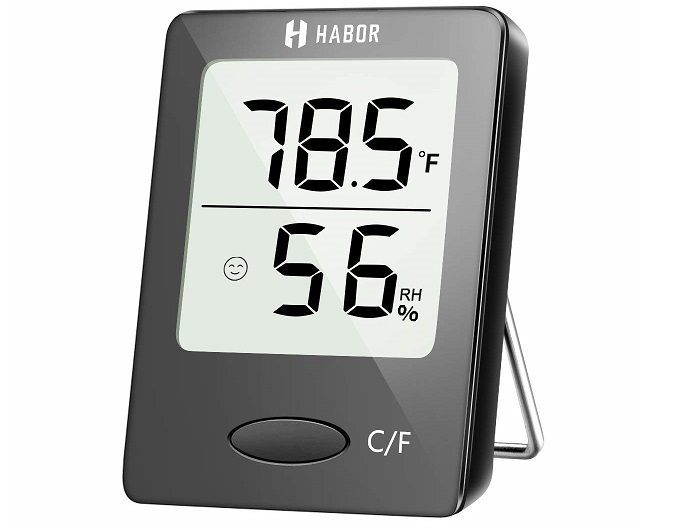 Habor humidity gauge indoor thermometer has no complicated function buttons, Indoor thermometer displays temperature in Fahrenheit or Celsius. Bright and black front panel with a clear LCD display, easy to read even from a far distance. Comes with a free CR2 batteries and 6 months working time.